Anthony will be speaking for the Edinburgh Association of Spiritualists at the Arthur Conan Doyle Centre on 7 March 2017. Full details of the event can be found on their website. 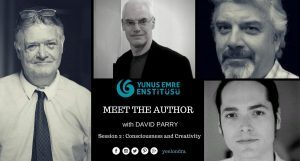 Book Launch of “Pandeism: An Anthology” Thursday 30th March 2016 at 1830. Come and hear Anthony Peake, Dr. Michael Arnheim and Sushma Sahajpal discuss their contributions to the fascinating new book "Pandeism: An Anthology." Each will give a short presentation followed by a Q&A, book signing and, for those interested, a meet-up at a local wine bar or pub. The Bradford Literary Festival 2017 – The Time Theories of J.B. Priestley. The Bradford Literary Festival 2017 – The Science of Immortality? Anthony Peake presents a startling new theory that attempts to explain the out of body experience.